The half width of 6nm is optimized for a maximum contrast between the (H-alpha emitting) object and the background. The contrast gain is much higher than with our 12nm emission line filters but you won't see too much stars in the resulting images. The Astronomik H-alpha-CCD (6nm version) increases the contrast between objects, in this case between the H-alpha emission line and the skyglow background in the same way as the 12nm version. The gain in contrast is much higher due to the smaller FWHM. The 6nm H-Alpha filter is the right choice for extremely dim objects, even in the milkyway, and for observations from heavily light-polluted places. The Astronomik 6nm H-alpha-CCD completely suppresses the emission lines of artificial lighting (mercury (Hg) and sodium (Na)) and skyglow. 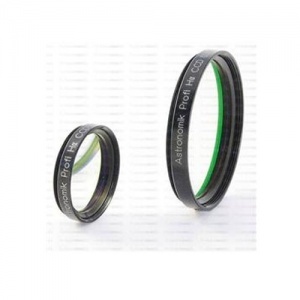 Transmission losses and chromatic distortions, which arise with other filters, only occur with Astronomik filters when extremely bright aperture ratios come into play. Selected filters for faster system are availble upon special request. If you plan to do (false-)color imaging with other emission line filters, you should get our matching filters with 12nm FWHM. Images taken with filters with differing FWHM are very difficult to combine into the final image.